What is 1-800-PetMeds Ear Cleansing Solution? 1-800-PetMeds Ear Cleansing Solution is a specially formulated solution used to clean, dry, acidify, and deodorize your pet's ear canal. The cleanser makes it difficult for bacterial or fungal infections to occur. Made in the USA. How does 1-800-PetMeds Ear Cleansing Solution work? 1-800-PetMeds Ear Cleansing Solution is scientifically formulated to clean, dry, deodorize, and acidify the ear canal to restore and maintain the pet's healthy ears. The ear cleansing solution is an antimicrobial, antiseptic cleanser that comes in a soothing aloe vera gel base. It's scientifically formulated to clean, dry, deodorize, and acidify the ear canal to restore and maintain your pet's healthy ears. Avoid contact with eyes. If redness, irritation, or sensitivity occurs, discontinue use and contact your veterinarian. This product is for topical use only. 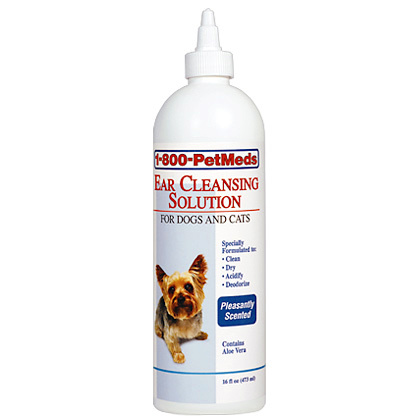 1-800-PetMeds Ear Cleansing Solution is for Dogs and Cats, and is used to keep your pet's ears clean and healthy. 1-800-PetMeds Ear Cleansing Solution can be used 1 or 2 times a week or as often as recommended by your veterinarian. 1-800-PetMeds Ear Cleansing Solution is for topical use in the ears only. Do not get in your pet's eyes. Application into your pet's ears after swimming is recommended. Apply generously but carefully to the ear canal. Gently massage the base of the ear. Allow your pet to shake head, then clean excess with a cotton ball. For very dirty ears, apply 2 or 3 times daily for several days. Keep cap tightly closed. Store in a cool, dry place. Other Ingredients: Deionized Water, Propylene Glycol, Aloe Vera Gel, SD Alcohol 40-2, Lactic Acid, Glycerin, Dioctyl Sodium Sulfosuccinate, Salicylic Acid, Fragrance, Benzoic Acid, Benzyl Alcohol.